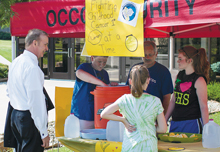 OCCC President, Dr. Paul Sechrist, waits for the first cup of lemonade from Alex’s Lemonade Stand on June 27 in front of OCCC’s main entrance. The lemonade had no set cost, but donations were accepted. Donations go to the Alex’s Lemonade foundation to help find a cure for childhood cancer. The seventh and eighth grade students from the first class manned two lemonade stands on June 28 — one outside of the Main Building and one at the FACE Center. The class is from Monday, July 9 through Thursday, July 12, he said, with the students from that class leaving the classroom to sell lemonade on July 12. Again, there will be two stands — one from 10 a.m. to 4:30 p.m. Thursday, July 12, outside of the Main Building, and one from 8 a.m. to 5 p.m. the same day at the FACE Center. For more information about Alex’s Lemonade Stand Foundation or to enroll in College for Kids classes, contact Dresel at bdresel@occc.edu.